The Hello Kitty Cafe truck — a bright pink Mercedes van adorned with flowers and the feline Sanrio mascot — will be heading to Walnut Creek this weekend as part of its roving tour across the United States. According to the cafe's official Facebook page, the truck is scheduled to be at Broadway Plaza near Macy's from 10 a.m. to 8 p.m. Saturday. More than 700 people have RSVP'd to the event, and an additional 3,000 people have expressed interest in attending. 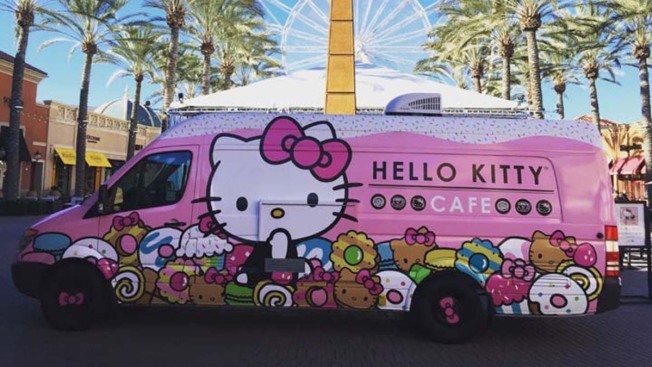 The Hello Kitty truck tours different cities selling — you guessed it — Hello Kitty gear and sweet treats, including twee T-shirts, coffee mugs and undoubtedly cloying macarons and doughnuts. Wherever it goes, a bounty of Instagram posts are sure to follow. Since making its debut at the annual Hello Kitty Con, a surprisingly real convention devoted to all things Hello Kitty, the truck and its hard-to-get retail items have attracted a rabid following on social media. It last appeared in San Jose in 2015. After it bids farewell to Broadway Plaza, the truck will make its way to San Francisco on Sept. 16.